Sight and Sound Theater "Jesus"
Experience the musical stage adventure about the most famous person to ever walk the earth and the every day people whose lives he changed forever. Every third Wednesday Memorial will be having a Family Night Dinner. We welcome everyone. There will be programing for Adults and Children! At Memorial we see this night as intergenerational. Please come if you have small kids, grown kids, or no kids. This formation night is laid back and pretty informal to leave space for connection. We welcome you to our table. For February it will be the last Wednesday the 27th! Hope to see you there! My name is Nampoina Randrianarivelo. I am a 17-year-old senior at The Bryn Mawr School (Baltimore) who worships at Memorial and assists with the Children’s Chapel, as you may know. I believe our community can participate more in the growing movement of environmental sustainability. One senior elective I take is a course titled “AP Environmental Science.” In this course I am constantly exposed to the ways in which we are often not very kind to the land which has granted us the space to grow and thrive. Every day I am challenged to question my own use of resources, and how I can influence others to be wary of their own. I have also become more aware of the complacency within our own government which is generally stuck in outdated facts and thoughts about global warming. Yes, global warming is indeed real. No, we should not wait until things get worse because it is presently happening now. I was recently thinking about snow days. Did you know that this February, the island of Maui experienced one of the rarest weather events? It snowed! Who would’ve thought that an island in the Central Pacific that is part of the Hawaiian archipelago would experience snow especially since average February temperatures range from 70°-55°. However, this isn’t the first physical change in “weather” we have seen. Climate change is happening right now and we will be part of the fight to save our Earth. I will continue to fight because I know how important the Earth is to me, my community, all life forms big and small, and generations to come. So I ask you, members of the Memorial Community. What can we do to continue the work? How can we work together to make the Memorial space a greener environment? How can we teach our young ones the importance of taking care of the environment? Because to take care of what we have now is to assure that Memorial will be here in 50 years as a space that will always be welcoming for all. One small step for mankind starts with being aware of your impact. You could try substituting plastic cups with recycled paper products, or, even better, washable mugs and cups! Instead of using plastic utensils, try washable utensils! Bring reusable tote bags when you go grocery shopping; you can even customize them yourself! I ask you to rethink the way you dump food into your trashcan. Could you have done more with it? How about for those of you who have children or grandchildren who love making you drawings until they completely fill up your fridge and all counter space. If you’re thinking of tidying up (discreetly, of course), why not recycle it? If you are unsure of what or how to recycle, simply google “how to recycle in,” and specify the county or city you live in. Battling climate change is not done in a day and the problem does not have one simple solution. However, I urge you all to take action today and care for all of God’s creations. It is a joy, as it is every year, to watch Memorial Player’s productions come to life. From the very beginning of dance and music practice in the upstairs parish hall to the final run-throughs on stage before opening night. Over the years we have seen Annie find a family, we have dealt with race issues in america and class issues overseas, we’ve imagine fairy tale worlds where things aren’t what they seem, and found news ways to interpret stories from our own holy scriptures. So it is perhaps significant that this year we spend two weeks in O contemplating what it means to be ‘home’ and that we do this with a very racially and gender diverse cast. Dorothy leaves Kansas the same way many of us encounter the world today - frustrated with the way things are, annoyed that change isn’t happening fast enough, but almost hopeless that things can get better. ‘It just is’ - whether we are dealing with difficult family, snake oil political and business leaders, or just plain old evil people. But in her travels through Oz - and confronting directly some of those same evils! She is able to find courage, heart, wisdom and most of all community to create a better world. That is my hope for us at Memorial. That we may come here from different walks of life, different backgrounds and experiences, even different faith journeys; and that we may come really unsure if we can ever make a substantive difference in the world. But - that together as we grow our faith, explore what it means to follow Jesus, and come to believe and understand that resurrection was possible than and remains a possibility now — we can make a new ‘home’. We are reminded in Galatians that we are ‘Children of the Promise.’ This promise of a New Jerusalem where we are no longer judged by the color of our skin, by where come from, by who we are or who we love, but instead we are recognized only and exclusively as Children of God, sharing the same courage, same heart, and same wisdom. So as you come to ‘The Wizard of Oz’ - I encourage you to think about what ‘Oz’ looks like for you? What is the kind of home you imagine when you close your eyes and imagine the people of God together in harmony? And how can you help Memorial embody that not just on Friday and Saturday nights for two weeks - but on Sunday Mornings for the rest of the year. 7:30pm- Tri- Church Service with a Joint Choir hosted by Corpus Christi! 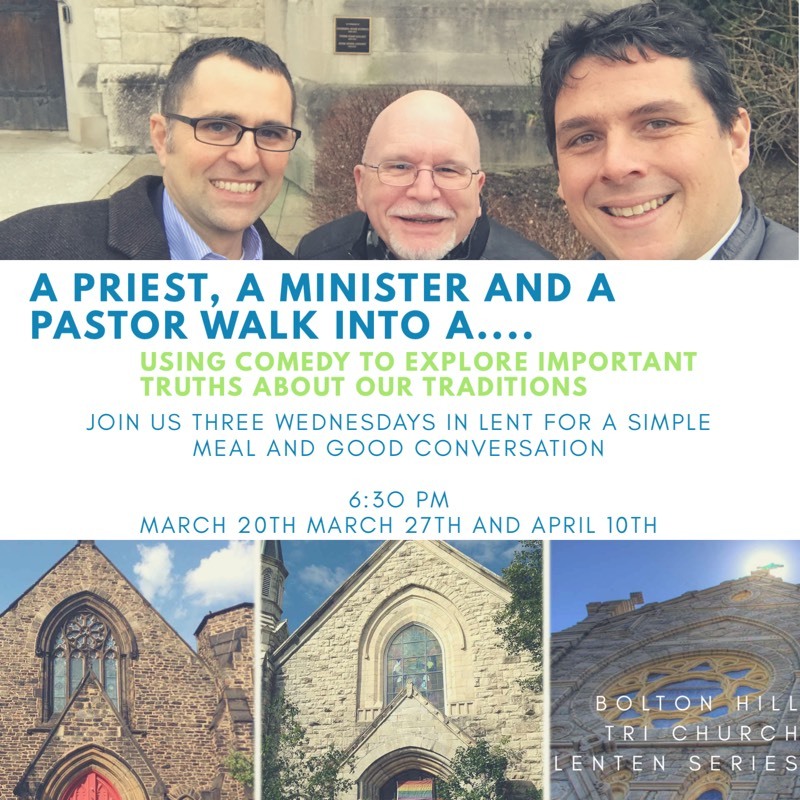 ‘A Priest, A Minister and a Pastor Walk into a...’ — You don’t usually associate comedy with Lent, but humor is often a good way to highlight some of the most troubling and difficult parts of our traditions and bring them to light. Join us this season as Father Marty, Rev. Grey and Pastor Foster-Connors each look at how their traditions are portrayed in comedy and cinema and television to explore what some of our biggest sins are as traditions and to explore how we can become better reflections of the Church and of Jesus going forward. As a musician, I wear many hats. Currently, one of those hats is after-school music teacher at Mt. Royal School. After our Tuesday staff meeting, I haul my steel-string guitar, various random sheets of music, and a copy of LEVAS over to the stark but spirited music room at Mt. Royal. I’ve been a substitute teacher with the Carroll County schools for about a year, and I know I’m spoiled by their system. In the elementary schools, all class levels enjoy one hour of “specials” each day, including P.E., music, art, and health. But it sounds like exposure to the arts at Mt. Royal –and at many city public schools -- is sadly infrequent. To help remedy the problem, I applied for a teaching grant from Baltimore Office of Promotion and the Arts, which enables me to work with a handful of 3rd, 4th and 5th graders once a week on music, specifically, vocal music. It has been difficult to decide what to work on in the brief hour that I see the students each week, especially what repertoire to sing. As my inspiration, I’m using Black History Month, the social justice movement that is sweeping the choral world, and Memorial’s dedication to talking about difficult topics. Our repertoire focuses on songs of the civil rights movement. The kids have learned “This Little Light of Mine,” “This Train is Bound for Glory,” and “We Shall Not Be Moved.” They’re covering the basics of good vocal technique and reading music. They’re experiencing history through song. As we are searching for a communal repertoire that addresses how we feel in these divisive days, I’m hoping that these songs, through the voices of our children, lead the way to better community dialogue. This is what Paul says about our life, and our faith, if we don’t have the resurrection at the center of our faith story. And it’s true! If we don’t believe that Christ died and was raised, how can we believe that any other resurrection is possible? Can we believe that our sins are forgiven if Christ is not risen? Can we believe that ‘it gets better’ if Christ is not risen? Can we believe that there is hope for those suffering with addiction if Christ is not risen? Can we believe that there is more to life for the kid growing up in a violent neighborhood, a 17 year old who gets locked up too young, or the woman who loses a child, if Christ is not risen? As we as a Memorial Community focus our time and attention on the hard work of racial reconciliation, ‘un-Segregation’ and deconstructing white supremacy, we cannot forget that at the heart of this is the resurrection. Resurrection for us. For our parish community and for the city of Baltimore. The call then to ‘justice’ here is not one of politics, or progressivism, or any cause, it is a call of faith. The faith that Christ died. And was raised, and that that same resurrection is available to all of us. “What are the different retirement living options, and what can I afford?" “How do I put my current home on the market?" “How do I get rid of 30 years of stuff ?!?! " Saturday, March 30th from 9am - 12noon, with light lunch to follow. made the move, and those who are scratching their heads! !